It's Almost That Time: Schedule Your AC Tune-Up Today | AllTech Services, Inc. Waiting to schedule your next air conditioning tune-up for too long could leave you with more trouble than you bargained for. First off, if the system is completely broken down it will do you no good at all and leave you scrambling to schedule repairs. 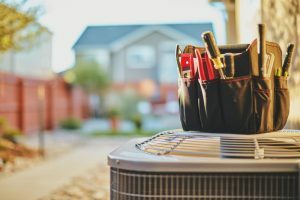 Secondly, operating an inefficient air conditioner could lead to a chain reaction of problems for your air conditioner, not to mention your wallet. During your maintenance session, our HVAC pros make necessary adjustments to ensure that your cooling system is both efficient and effective, keeping repair needs and utility bills to a minimum. It’s been estimated that your air conditioner loses 5% of its energy efficiency every time it misses maintenance. Routine tune-ups can help your system retain 95% of its efficiency upon installation. The last thing any homeowner needs during a heatwave is for their air conditioner to suddenly break down on them. A malfunctioning cooling system could leave you pretty uncomfortable during the hottest time of the year. It’s better to be proactive instead of reactive! Scheduling your tune-up now ensures that your air conditioner keeps working reliably, getting you through even the hottest summer weather. Don’t sacrifice your comfort for a suffering air conditioner that can shut down any minute! Too often, homeowners wait until the last minute to schedule their annual tune-up. Or, they wait until summer is already in full force. And usually, this is when local HVAC pros are scrambling to answer emergency repair calls, making it harder for you to schedule a tune-up when it’s more convenient for your schedule. Scheduling your maintenance tune-up now means that you’ll be able to make an appointment at your leisure, and will also leave you plenty of time to schedule repair needs should they crop up during maintenance. There are a couple of tasks you can do on your own to prep your AC for summer. For example, you can look around the outside unit, collecting and disposing of any debris that’s settled on and around it, as this can negatively impact airflow. You can (and should) also change your air filter. The air filter is usually shared between the furnace and air conditioner, so it needs to be changed every 1-3 months to prevent problems. True maintenance though—that is, cleaning the system and making adjustments, requires a pro for the job! For reliable air conditioning maintenance, look no further than AllTech Services, Inc. Contact us today!